On January 20th, it will mark the 20th year anniversary since I started working in the IT industry. A lot has happened over the course of the last two decades both on a personal and work levels, as you can imagine, and, yet, it feels as if it was just yesterday. That is, probably, why, over the course of the last couple of months, a growing urge to find a new work adventure has taken over yours truly. Till now. That search is now over. 2017 will, definitely, be a year of change and milestones, I’m pretty certain, but it’ll also be a year of excitement, of new dazzling opportunities for learning and growth, of discovering wonderfully inspiring initiatives to experience, experiment with and learn from. In short, it will be a year of new beginnings. And, for yours truly, that time has, finally, come. As of January 16th, I have now joined panagenda. Let the new adventure begin! Now you know why I haven’t blogged much over the course of the last four weeks. It’s been a bit hectic with the Christmas holidays, the time off with family and friends, the search for a new work adventure, the rather nasty flu I’ve just recovered from, the time to unlearn and relearn while deciding what I wanted to do next pondering whether it was a good time to go back to basics or not, etc. etc. all in all confirming a lot has been going on so far, but when the right opportunity shows up you know you just have to go and grab it, before it vanishes into thin air. And that is exactly what I did! I grabbed it, or, probably, better said, it raptured me big time. It all started with a short conversation in an online collaborative space that is not even widely available to everyone out there just yet. It all begun by tapping into one’s own social networks, where, usually, the magic happens: you know, you get to talk and converse with people who know you rather well (probably even better than you do yourself!) and who are willing to help open up new paths for you, because they feel the timing is just perfect. That’s why I’m pretty excited and rather enthused, beyond words!, about having already started writing a new page in my 20 year long career in the IT industry by joining panagenda this past Monday. Those of you who are already very familiar with panagenda will know what a real treat, honour, and true privilege it is to say I’m now a panagendean as well. Those of you who may not know much about them and what they do (just yet!) I can tell you they are an amazing team of rather talented, gifted, very helpful and knowledgeable folks doing some pretty mind-blowing things while helping organisations transform the way they work as they join the 21st century. They do walk the talk. Every time. And you will know what I mean very soon. So, ‘what is panagenda, again?’, you may be wondering, right? Well, they are an international company with offices in Austria (The HQ is in Vienna), Germany, The Netherlands and the United States. They primarily focus on helping organisations understand and make sense of the different IT and Collaboration solutions they may have been using over the course of time in order to help accelerate and improve their various business transformation processes and tooling. Their motto is ‘Make Your Data Work For You’, so they work with a good number of customers helping them understand how to work smarter, not necessarily harder (Which is, as you well know, my favourite mantra) with the data they produce within their own collaboration landscape. They provide a good number of different analytics solutions, extensive expertise (advisory work) and consulting services around both traditional communication and collaboration tools, as well as emergent enterprise social networking software, bridging both worlds rather nicely and intuitively to help address whatever the different business problems customers may face, as well as help them identify new business opportunities. Don’t worry, over the course of time I plan to put together over here a number of different blog entries explaining more in detail what panagenda has got to offer as well as the kind of work my colleagues and myself do for our clients, which I guess has just triggered an additional thought from all of you out there in terms of what I will be focusing on myself from here onwards, right? As a starting point, I’ll continue to do lots of advisory work and consulting services around Social Business and Digital Transformation, along with a specific focus around Analytics, covering areas such as Corporate Communications, Collaboration, Learning, Knowledge Management, Digital Workplace, Adoption / Adaptation of Emergent Social Technologies and, in general, Business Transformation. My goodness, quite a challenge trying to summarise 20 years of working experience, don’t you think? Phew! Either way, did I already say how excited and thrilled I am about having such a fantastic opportunity of working together with quite a sensational team of very smart folks always willing to help their customers, business partners and fellow colleagues become better at what they already do? Well, if I didn’t say it before, I will now: I’m beyond words, literally, to have been given such honour of working on this new work adventure I just started a couple of days ago and that it’s beginning to feel like the 20 year long wait doing other things was just totally worth it! Every single minute of it! Thus with all of that said, it’s now time for me to go back and get on with the overall on boarding process, and in case you are wondering about whether the themes and topics I cover in this blog will substantially change from here onwards, fear not, you are just about to get exposed to some rather thought-provoking write-ups on what purposeful digital transformation programmes are all about. Are you ready? I surely am! Today is my last working day of 2016, before I go offline (from work) for my winter holidays till mid January next year. Somewhere in between, I don’t know just yet when, there will be a major announcement coming through that will explain what I will be doing throughout 2017 and beyond. After 20 years in the IT industry, I can share ahead of that announcement there will be a massive process coming along of unlearning and relearning for yours truly. Yes, I am incredibly excited about it, because it’s about something I haven’t done for the last 20 years, so it will be a rather interesting rebirth (of sorts) upon my return to a new workplace. But in its due time, I suppose. For today though I’ll go ahead and try to summarise what this year has felt like so far and, when doing so, there is a single word that comes to the top of my mind that would describe, pretty well, what it has been like: humanise. I know, it’s a strange word to go for, but let me try to describe it further in detail with a story connecting three different tidbits that have impacted me significantly on what I have learned throughout this year, both at work, as an independent adviser / freelancer around Social Business and Digital Transformation, as well as in my own personal life. Throughout the year I have been exposed, pretty much like everyone else, I’m sure, to thousands of different ads and marketing campaigns on any kind of topic or product you can probably imagine and through multiple different platforms (whether on TV, radio, newspapers, the Internet, etc. etc. ), but there has been one of them in particular that has wowed me so badly that every single time there has been either a local or global event with a significant impact (whether positive or negative, although mostly negative, I must confess) I end up watching it over and over again. So far this year, I could venture to state I may have watched it a couple of dozen times already and somehow I never get tired of it. Quite the opposite, I almost always end up going a bit teary and emotional altogether. Both the ad and marketing campaign come from Momondo, under the rather suggestive heading ’The DNA Journey’, by starting to ask yourself perhaps one of the toughest questions out there: ‘Would you dare to question who you really are?’ Hold on, don’t answer that just yet. Wait for a little bit more… Try to go through ‘Let’s open our world’ in its entirety and then ask yourself, again, that same question and see what you can come up with as an answer. Something tells me it may surprise you and quite a bit altogether! Now I understand fully why nearly 4 years ago I decided to, at long last, ditch Social Business in favour of Open Business. Now you may be able to understand a bit better why humanise is the word that would pretty much describe what 2016 has been like for yours truly. That was my very first reaction when I first watched the short video clip I have embedded above around The DNA Journey. Why? Well, because while going through the clip I got reminded of this other video from Big Think by Dr. Michio Kaku where he tries to answer the following question: ‘Will Mankind Destroy Itself?’ Interestingly enough, that clip is from 2011 and yet, unless you have been hiding in a cave throughout 2016, it looks like as if it was shot just yesterday. Flabbergasting and gobsmacking in equal terms, I tell you, but, don’t worry, Dr. Kaku’s discourse is not necessarily negative, nor pesimistic on its own. Quite the opposite. It poses a very interesting reflection with plenty of thought-provoking insights as to whether we, humans, are somewhat ready to make the transition from Civilisation Type 0 to Type 1 and in a world where we seem to have reverted back to Type 0, it’s probably a good time now to start questioning whether we, citizens of this world, are ready and willing to participate, getting actively involved, leaving behind both apathy and complacency, to change this world as we know it today. Strongest force in US politics is apathy, not anger. Take out the word ‘US’ out of that tweet and insert whatever other country acronym and it would apply just perfectly all right. I do keep wondering, seriously, as to whether we would be able to evolve accordingly into Civilisation Type 1, specially, after the many dramatic events happening this year, or whether, instead, we will be that generation that will contemplate, muse and witness the planetary suicide Dr. Kaku hints in the clip I embedded above as well. Will we be ready to engage in such an enduring test though to revert course and head on for Type 1? I just don’t know. I hope we do. Seriously, for our very own good as a species on this planet. Maybe, it’s down to all of us. Maybe it’s all down to being human, after all, and about re-humanising ourselves, once again, through, funny and ironic enough, the various, different digital tools that have definitely transformed, for good, the way and how we communicate with one another not only on a local basis, but on a global, planetary one as well, pretty much like Gutenberg’s printing press did 576 years ago. It’s that kind of revolution we are after, folks, we should not forget about that. And while I realise this blog post may not have much to do with either work nor our personal lives, I actually think it does and big time. It’s who we are, it’s what we do, it’s what we fight for, it’s what we learn that makes us better at what we do already and if I were to describe what it is like it’s about being human, about accepting our very own vulnerabilities and learn to adapt and live with them with grace so that, eventually, they will make us all stronger as a result. This is why, as a moderate optimist, I would love to close off today’s blog entry with a song. A song that’s become my favourite tune for this year, and, probably, within my Top 10 from all times, because, if anything, it pretty well describes what 2016 has been like: new dark times, BUT with plenty of light in the horizon, inspired by understanding not only both our limits and vulnerability, but also what we are all good at to overcome those: caring more (for one another), becoming more empathic and, overall, more human. Merry Christmas, everyone, and a Happy, Healthy and rather Prosperous New Year to you all! This week is my last working week of the year, and as things are starting to quiet down a fair bit with the upcoming Christmas holidays and everything, there will be some light blogging coming along for the next couple of weeks, where perhaps I will be writing some more about non related work items than anything else, and since I have got already the ‘Gran Canaria – A Mini-Continent to Rediscover’ series going on at the moment, I thought for today’s blog entry I would share a few thoughts about my next recommendation on the list of wonderful places to eat and dine for your upcoming holidays in Gran Canaria, or if you already live here perhaps have another noteworthy option to consider. 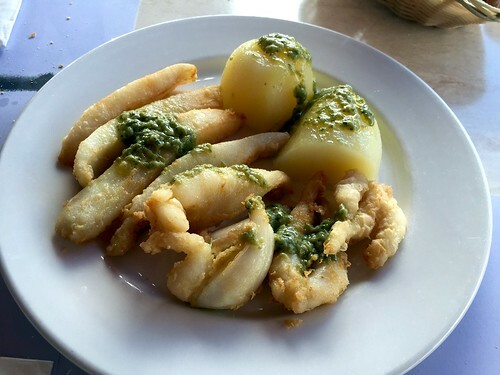 The next one I can describe it with a simple, short, rather evocative sentence: ¡Viva la Tapa! 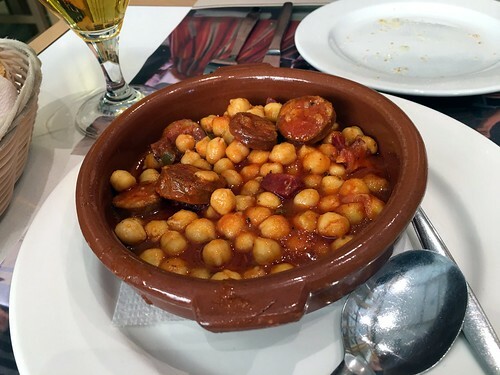 La Tapita Los Jose’s is one of those unforgettable places you just can’t miss out, specially, if you are looking to enjoy some rather creative, genuine and scrumptious Spanish tapas. Off the beaten track from the main touristic spots, it’s a rather busy bar / restaurant located in San Fernando where I always typically advise people to arrive a little bit early either for lunch or dinner, so you get still get a table without having to wait much, or at all. So arriving there around 13:30 or 20:00 would be just perfect. Then be prepared to be wowed! It’s been recently refurbished (earlier on this year) with a rather modern look with good tables and comfortable chairs and overall very spacious considering the constraints of a relatively small place. 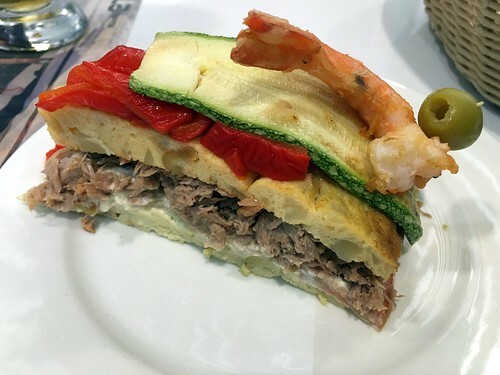 The lighting has been greatly improved and that’s a good thing, because your eyes typically end up eating before you do, so the first thing you will see upon entering the place is a wonderful landscape display of rather enticing and appetising Spanish tapas to choose from. Yes, I know, at this point in time, and before you even seat down further you will be drooling big time. Don’t worry, it’s all right. We all do it. Every time. It’s normal. That’s part of the ritual of having a gorgeous meal waiting for you just a few more minutes. 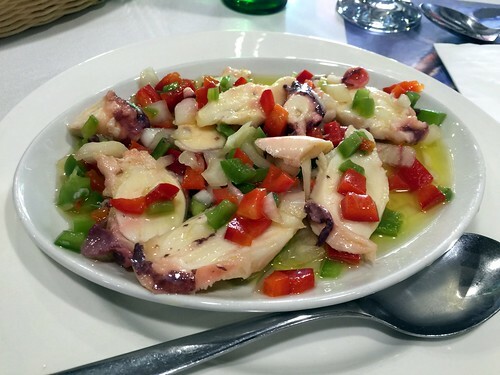 All of the staff members, including the owners (Los Jose’s), are incredibly good at their jobs, very competent, amicable, rather friendly, with a smile and a few kind words always ready to make you feel rather welcome while at the same time providing you with a really good service. You will get to experience the power of their smile and, believe me, it makes a whole lot of a difference in what you are about to experience next: the food. But it gets way better than that! Because after enjoying the many rather delightful and mouthwatering tapas, you would need to make some more space for the desserts, just because. In a word, they are just exquisite! My personal favourite is the homemade ‘natillas con galleta’ (i.e. custard with a cookie), which, in terms of different types of custard out there at other places, it’s as good as it gets! Seriously, I would challenge anyone out there who tries it that they won’t be able to find anything else that tastes like it in the whole island. It’s that good! Love it! Yes, I think you may have realised by now how I haven’t shared any picture in this post about the different desserts they have on a daily basis. I know, it’s done on purpose, don’t worry. That way you prepare yourself, through that wonderful mental exercise, for the many luscious dessert options you will have at your disposal after your meal, so much so it will be tough to make a choice. They are all very good choices altogether, so I know you will be back for more over and over again! Just like all of us keep doing already over the course of time. Everything at La Tapita Los Jose’s is homemade, just like mum’s own cooking, for the day, with rather fresh ingredients and tons of love and care, as it should be, and, best of all, at incredibly reasonable prices reminding you each and every bite why Spanish Tapas have been ever so popular, after all. 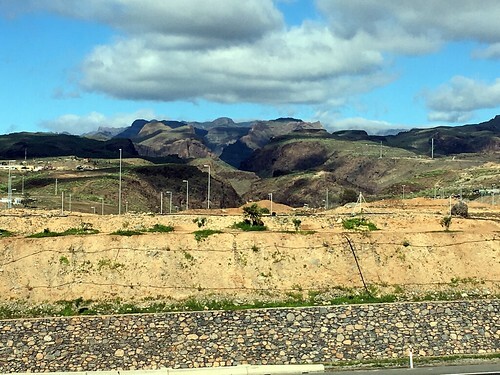 So much so, I know next time you come to Gran Canaria you will repeat again. 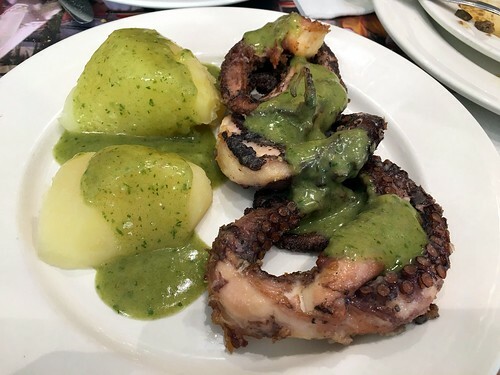 Oh, and if you already live here, it will become part of your weekly or monthly pilgrimage to, by far, one of the best tapas bars in Gran Canaria. All of us, eventually, end up going there. Now, I am not going to spoil it for you the rest of the presentation Ben created, but I can strongly recommend you take a look into it, if you are still questioning whether your business is ready for #mobilefirst or not. If that deck doesn’t convince otherwise, I don’t know what would, frankly. It’s a brilliant piece of work that can give us a glimpse of not only what’s coming, but also what’s already here and that we are experiencing day in day out. Really good work! But since I am embarked already with this post into the existing series of My Top 5 iOS Apps of the Week blog entries for personal mobile productivity, I guess I will just stick to it and share along the next round of iOS Apps I would recommend that may well be worth while giving them a good try. Hopefully, there will be something out there for everyone! In terms of themes, in case you may be wondering, this week we have got Business (Task Management), Productivity (RSS News Feed Readers, Mindmapping, Curation) and, finally, as usual, Photography. For now though, I will want to share in today’s blog post another one of my favourite iOS apps for task management. In the past, if you remember, I have already talked about Trello, Clear, Productive, Asana, but in case none of them would tick for you here is another one I have enjoyed quite a bit over time: Todoist. And here are two things I enjoy the most from this app: the ability to use labels when creating different tasks I can filter through a specific tab at a later time and see what kind of work I have been doing all along in a nutshell is pretty nifty on its own, never mind as well the capability of filtering those very same tasks by both priority as well as who they have been assigned to. Then the option to have chatting along tasks can be pretty effective overall, specially, if you create group tasks for your team(s), as well as the one of being able to use your own voice to record tasks, work with documents, custom labels, etc. etc. Like I said, worth a try if you are still looking for an effective, user friendly and overall helpful task management app. Fiery Feeds: Ok, on to the next one. In previous blog posts I have been talking about RSS news feed readers (Yes, I know, I still read RSS feeds daily!) and how, at the moment, I’m using two of them for both my iOS devices as well as my MacBook Air: Feedly and Reeder. However, while both of them are rather good, they are not very advanced in providing you with some extended capabilities that would make it easier for you to work through hundreds of feeds at a time. So, my suggestion, in this particular case, is to perhaps point you to one iOS app that would allow you to handle hundreds of them relatively easy without having to ditch anything else, because it actually integrates it quite nicely. I am talking about Fiery Feeds. Just browse through the Web site and you will see why I’m recommending it as a superb app for RSS news feed reading for power users. Perhaps as good as it gets. iThoughts: I love mindmapping. It’s perhaps one of my favourite business productivity activities and for almost everything. There isn’t a single day in my work week where I don’t use mindmaps to jot down ideas on whatever the business topic and see where that would take me. Or to gather my thoughts on a specific topic to make sense of it before I may take whatever further steps. In the past, I have already talked about MindNode as the mindmapping app I use the most often, but there is another one, perhaps a bit more complex and advanced in terms of functions and capabilities, I tend to use for more complex work and that is iThoughts. You may be wondering what makes it special, right? Well, you can import and export pretty easily different document formats and mindmaps, so you can continue already existing work without having to start from scratch. You can multitask with it having side by side windows, or you can use the hand off option where you start a mindmap in one device and finish it off in another one almost instantly. But you can also use this app for task management to keep track of the progress you make within your mindmaps. You can also multiple different formats, layouts, icons, styles, filters, etc. etc. making iThoughts perhaps one of the most advances mindmapping apps for iOS. Totally worth the money, believe me. I can highly recommend it, specially, if you are a mindmapping power user. Nuzzel: There used to be a time where I was rather fond of Nuzzel to curate interesting and relevant content I would bump into from different Twitter sources, but at one point in time something happened in one of the updates where, to me, they pretty much destroyed the overall user experience making it much more cumbersome and unnecessarily complex to keep up with what you were interested in. Fast forward to 2016 and it’s fast developing into becoming one of my favourite apps to discover new interesting articles and publications not only matching my own interests but also what others may find relevant to them. And the capability of creating your own newsletters through it makes it rather engaging, because, in a way, it feels as if you are building and curating your own magazine of interests, themes and topics. Really cool! And if you use Nuzzel on an iPad Pro with all of that screen resolution available to you, my goodness! All of a sudden there it is your Sunday morning news paper over a lovely cup of coffee right at your fingerprints! Simply brilliant! I tell you, if you haven’t used Nuzzel in a little while, it may well be worth while taking a look into it, once again. I suspect it will be worth it for you as well as it has been for me so far. I’m really glad I didn’t remove it back in the day, because when I started this series of blog posts I decided one day to open it up and haven’t walked away from it ever since! Worth checking it out once again, in case you haven’t! Picky: And, finally, the last iOS app recommendation of the week is, yet again, a photography app. Like I mentioned, I have got a couple dozen photography apps on both my iPhone and iPad Pro and I just can’t help it recommending one after the other week in week out, because they all have got something to offer. Take a look into this week’s pick. It’s called Picky. Just wish other iOS apps would treasure and appreciate my privacy with my photos as this one does! Simply stunning! And that’s it, folks, for this week’s My Top 5 iOS Apps of the Week blog entry. Next week I will be back with another round of recommended iOS apps although I may post it earlier in the week as opposed to over the weekend. We shall see … For now, I hope you folks may have enjoyed this week’s suggestions as much as I have so far and, again, if there would be an iOS app out there you would want to recommend I should try out, as usual, leave a comment below or reach out to me via Twitter at @elsua. I will be more than happy to take those suggestions for a spin and then let you folks know how it went and whether they would still stick around with me. Till next time! Have a great one everybody! If you have been reading this blog for a long while, you would know how last time I changed its name, if I recall correctly, was back in 2008 (‘E L S U A ~ A KM Blog Thinking Outside The Inbox by Luis Suarez’) and it took me several weeks to, finally, come to terms with it and feel good about it. Now, fast forward to January 20th, 2017, a bit over a month from now. A date that will mark the end of a life cycle for yours truly, as I will be celebrating my 20th year anniversary in the IT industry. I am, indeed, starting to feel the urge to look for a new title altogether for this business blog. Why? Well, mainly because almost everything I have done for work over the course of the last 20 years, specially, that piece of work related to plenty of the heretic topics I have blogged about over here, may well be a thing of the past. It’s a new, changing time. It’s a time to move on and start again (almost) from scratch into whatever comes next. So, what name do you think should I pick for this blog? Any suggestions or ideas coming out so far? So the challenge to find a new name, or title, for this my business blog still remains, even more so when I am yet to announce the major changes happening to yours truly from mid-January next year onwards, upon my return from the Christmas holidays. I know, I know, I am just such a tease, aren’t I? Well, all will be announced, properly, in its due time, don’t worry, I am not planning on leaving you all in the dark, just like that, but today I thought I would perhaps reach out to all of of you folks, long time faithful readers of this blog, if you are still around, to come to the rescue of this poor blogger who can’t think straight anymore about a new title for his own blog, before he can move on. What do you think? Based on 11 years since I published the first blog entry over here, how should I call it? How would you want me to call it? Any ideas or suggestions I should consider, please? Now, I realise once that major announcement comes out, things will become clearer in terms of potential names and titles I could choose from, but since blogging is just such a personal activity (including you all as well, of course) I guess I could just continue searching for that new name. Why not, right? 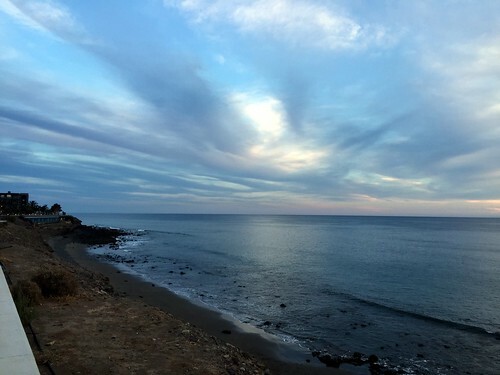 ‘Calma chicha’, as you may well know, would literally translate into dead calm, you know, when there are no waves, nor wind and everything out there in the ocean is completely dead still, either ahead of a typical storm or right after. 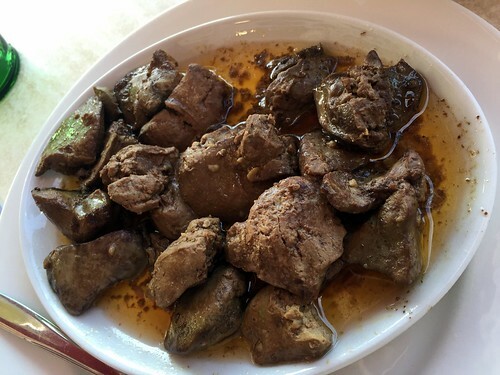 However, whenever someone would say ‘Calma Chicha’ over here in Gran Canaria, they are also referring to one of the most stunning experiences of the culinary sort that the south of the island has got to offer to different visitors. It is not only a treat to your eyes and ears with such a soothing ambience, but also to your tastebuds. 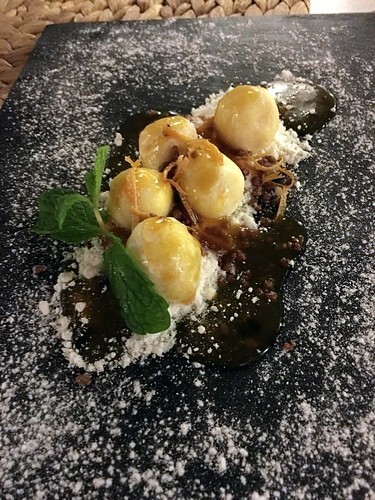 If you were to redefine contemporary Spanish cuisine, that would be it. 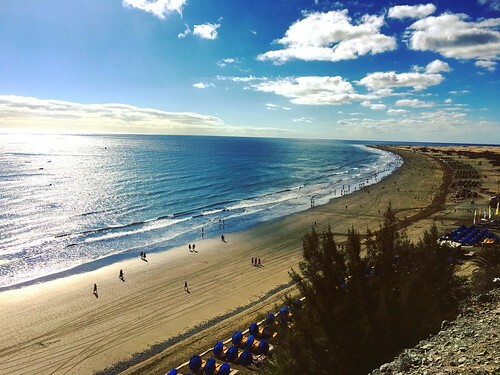 Right in the city centre of Playa del Inglés, and within a very short walk away from the wonderful Dunes of Maspalomas, Calma Chicha is one of those places that, unless you pay close attention, you may miss it as you walk by. Because, at first sight, the only thing you will be able to see and distinguish is its chill-out area, very nicely camouflaged with all of the different plants, comfortable sofas, chairs, big umbrellas and so forth. Despite being very centrical, it’s incredibly tranquil though, you would hardly notice there are people there hanging out, enjoying the odd cocktail or two while dinner is getting ready, or, of course, enjoying that lovely after dinner drink before you get started with the rest of the evening. 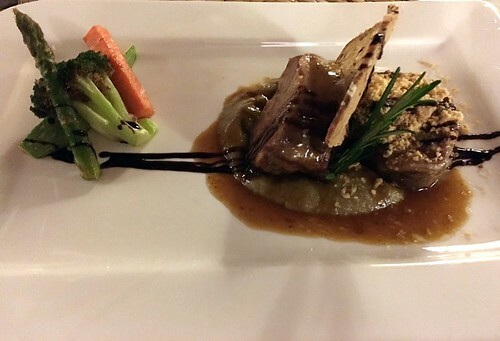 The portions are rather generous and all the prices adequate enough with plenty of great value for your money. 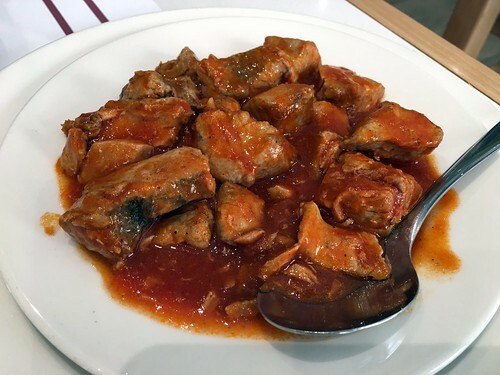 If anything, I can guarantee you right away you will not be disappointed by both the diversity of enticing Spanish dishes you can choose from as well as the menus. 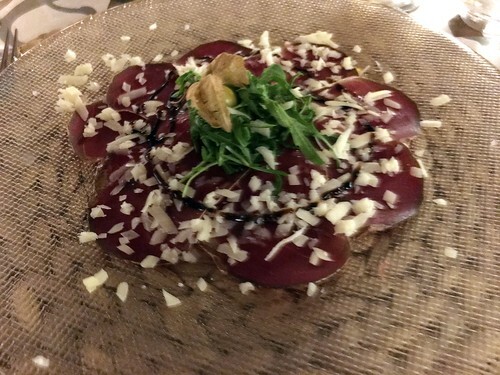 To give you an example, the attached picture below is Cecina de León, one of my favourite starters from the Spanish cuisine that comes from where I was born and raised, León, and that I haven’t been able to find anywhere else in the island, although I’m sure there may be some other places I haven’t been to just yet that may have it as well. 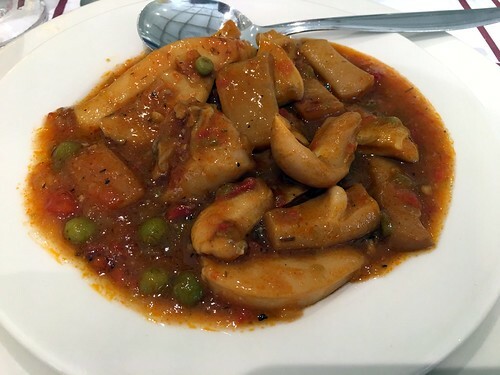 Either way, if you have ever tried it out already, you will know there is nothing like it, and in case you may not have tasted it yet, allow me to recommend you to give it a try when you order your next starter in there. Mouth watering already as we speak! I guess I wasn’t anticipating much of this when I first got things started with this new series of blog posts around ‘Gran Canaria – A Mini-Continent to Rediscover’, but the truth is that the holidays are just around the corner and I’m starting to have a hard time deciding which places I would be booking first to come back and pay another visit, but, if anything, I will tell you now that Calma Chicha would be one of them for real. Why? Well, because, to me, it’s literally like coming back home over and over again but without leaving the island altogether, which is, as you can imagine, as good as it gets, as opposed to have to travel over 2.000 kms and back. I don’t need to anymore. Calma Chicha is just around the corner to continue making me feel right at home.